When built, this Church was named one of the outstanding new churches in the United States, unique in design, sacred in space, challenging in faith. Welcome to our home. The new church was dedicated by Bishop Alfred Hughes on November 28, 1998. 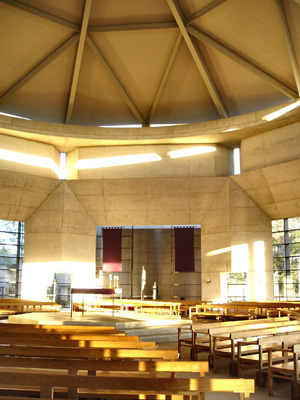 The church has received numerous awards for its boldness and simplicity of design, as well as, for the beauty of its many works of bronze sculpture designed by California artist Max DeMoss, consultation with priest and parishioners of St. Jean Vianney and Trahan Architects of Baton Rouge, contractor was MAPP Construction. The Edifice - The structure is made of poured-in-place concrete and glass. In the original church, the glass on each side of the sanctuary allowed the congregation to appreciate the importance of being part of the natural world during the liturgy. The parishioners wanted to retain this feeling in the new church. The church, when bathed in light, appears embraced by nature. The 15,000 square foot church seats nine hundred people. Eight huge columns hold up the ceiling that is covered in sound-retardant cloth stretched across wooden, geometric frames attached to the roof. The apex is seventy-two feet above the floor. The outside walls are forty feet tall, giving the roof a gentle, pleasing slope. The seeming starkness of the interior allows the gathered congregation to bring color to the church. Concrete pavers, resting on a bed of sand over the foundation of the building, compose the floor. Three Chapels for devotional, private prayer, as well as the Stations of the Cross, line the outside of the sanctuary in an eight-foot-wide ambulatory that encircles the church between the outside walls and the eight columns. Their separation from the main worship space distinguishes public worship from private devotion. The Doors-Two massive bronze doors form the entrance to the church; each door is thirteen feet one inch high, four feet wide, and weighs 1400 pounds. These and all of the bronze objects inside the church are the work of California sculptor Max DeMoss, whose inspiration for the doors was a visit to the Holy Family Church in Barcelona, Spain. The outside panels of the doors contain sculptures of over six hundred objects that belong to St. Jean Vianney parishioners. Clearly visible are rosaries, handprints, a wrench from the construction site, Fr. Blanchard’s mother’s knitting needles and the hilt from his father’s Knights of Columbus sword, a baby’s footprint, a child’s skate key, a brother’s eyeglasses, wedding rings, and many other mementoes that are highly emotional symbols for the people who built this church. They were cast in clay on the spot and immortalized in bronze. The top panels feature reproductions of fish, which DeMoss termed “a loaded image, a Christian symbol that is a transition from the complex, busy objects below.” The three repetitive figures at the very top are an invitation to the beholder’s imagination. The magnitude of the entrance portal and doors enables all who enter and exit to realize that, though we come to the House of God as individuals, we are in truth the one People of God. As you enter the Narthex, the low ceiling and tomb-like space leading to the baptismal font symbolize our dying and rising with Christ. While in the Narthex, look to your left and you will see a bas relief wall sculpture of Saint Jean Vianney in an alcove that leads to the sacristy. Baptismal Font - As you enter the nave, you pass a sunken, rectangular immersion pool into which flows water from a sugar kettle. The immersion pool symbolizes dying and rising with Christ. The sugar kettle came from the old church, and every person who has been baptized at St. Jean Vianney was baptized in this kettle. Reconciliation Chapel- To the left of the baptismal font is the Reconciliation Chapel. In the Church’s tradition, a person may confess his or her sins anonymously; thus the presence of the screen. One may also confess face to face; thus the presence of two chairs. On the wall of the Reconciliation Chapel is a sculpture of the Prodigal Son. From outside the Chapel, the shadow of a person who is inside can be seen through foggy glass panels. This calls attention to the understanding that Reconciliation is not just a private sacrament, but one that impacts the community, too. Next to this Chapel is the repository for the holy oil vessels of the church. The Sacred Chrism, Oil of Initiation, and Oil of the Sick are presented by the bishop to each parish church during Holy Week and then used throughout the year. The oils are stored in custom hand-blown glass carafes. The parishioners of the original church desired to retain the sense of intimacy that they enjoyed in that church. By focusing attention on the central altar, which is minimal and transparent in design, the people gathered around it can be conscious of one another’s presence and their bond as the family of St. Jean Vianney. The octagonal seating as well as the octagonal shape of the church represents the eighth day, the Resurrection of Jesus Christ. The pews face the main entrance of the church so that when you enter, you are conscious of the faces and presence of those already gathered. Those gathered, on the other hand, are able to be conscious of your coming into the community. Altar - The altar is directly in line with the baptismal font, as is the tabernacle on the south side of the building. No parishioner is more than twelve rows away from the altar. The altar is placed in the center of the church because it is the common table around which the community gathers, and during the Liturgy of the Eucharist it becomes the Table of the Lord’s Sacrifice. Because the altar is only one inch thick, the community is able to be conscious of one another’s presence during the Liturgy of the Eucharist. This five-foot-square piece of bronze on thin, square legs actually weighs eight hundred pounds. Fr. Blanchard’s communion chalice provided the pattern of the twelve apostles for the design around the lip of the altar. Tabernacle - The Tabernacle is a bronze monolith, which rotates so that the Body of Christ can be placed inside. The simplicity of the Tabernacle draws us to reflect on the mysterious presence of the Body of Christ within. The bronze sanctuary lamp hanging above and behind the Tabernacle casts a shadow of a dove on the floor of the Tabernacle Chapel. This lamp reminds us of the presence of the Blessed Sacrament. Stations of the Cross - The Stations of the Cross are found on the back of the eight columns in the ambulatory. There are only thirteen stations because the crucifix in the West Chapel is a powerful depiction of the twelfth station. The Stations of the Cross, in their realism, aid in meditating on Jesus’ walk to Calvary. Mary’s Chapel - The statue of the Blessed Mother in the devotion chapel on the east side of the building faces the crucified Christ on the west side. 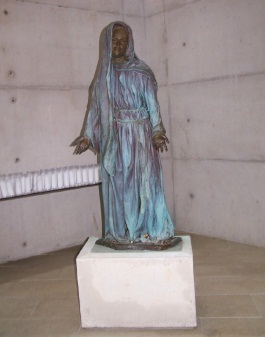 Both sculptures by DeMoss are of bronze, but are hollow, signifying the resurrection of both Mary and Jesus. 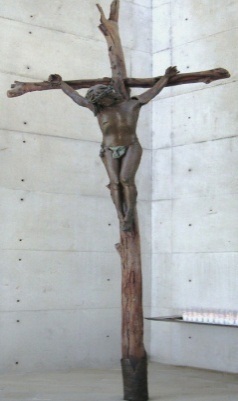 Chapel of the Crucifix - On the floor in the center of the chapel stands a seventeen-foot cross of eucalyptus logs with a life-size bronze sculpture of the crucified Christ. The sculpture is hollow and fragmented to symbolize that, though His body was broken, His Spirit was not.